선운사 도솔암으로 오르는 길 옆 절벽에 새겨진 마애여래좌상으로, 머리 주위를 깊이 파고 머리 부분에서 아래로 내려가면서 점차 두껍게 새기고 있다. 평판적이고 네모진 얼굴은 다소 딱딱하지만 눈꼬리가 치켜 올라간 가느다란 눈과 우뚝 솟은 코, 일자로 도드라지게 나타낸 입술 등으로 얼굴 전체에 파격적인 미소를 띠고 있다. 목에는 3개의 가느다란 주름이 있기는 하지만 상체와 머리가 거의 맞붙어서, 상체 위에 머리를 올려 놓은 것처럼 보인다. 상체는 사각형인데 가슴이 넓고 평판적이어서 양감없는 형태를 보여주고 있다. 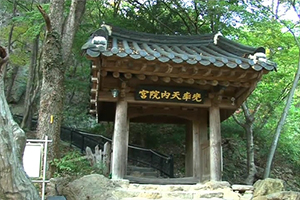 옷은 양 어깨를 감싸고 있으며 옷주름은 선을 이용해 형식적으로 표현하였고, 평판적인 가슴 아래로는 치마의 띠매듭이 선명하게 가로질러 새겨져 있다. 무릎 위에 나란히 놓은 두 손은 체구에 비해서 유난히 큼직하고 투박하여 사실성이 떨어지는데 이는 월출산에 있는 마애여래좌상과 비슷한 고려 특유의 마애불 양식이다. 층단을 이루어 비교적 높게 되어 있는 대좌는 상대에 옷자락이 늘어져 덮여 있으며, 하대에는 아래를 향하고 있는 연꽃무늬를 표현하였다. 이 불상은 고려 초기의 거대한 마애불 계통 불상으로 크게 주목받고 있으며, 특히 가슴의 복장에서 동학농민전쟁 때의 비밀기록을 발견한 사실로 인해 더욱 주목받고 있다. 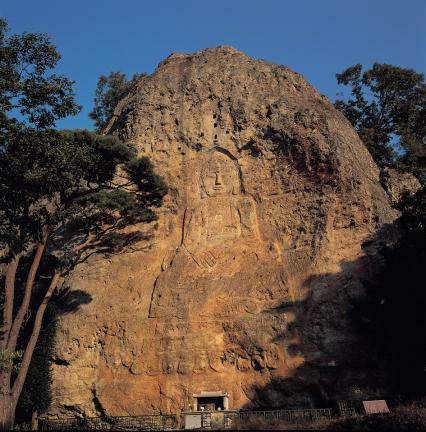 It is a rock-carved seated Buddha on the roadside on the way to Dosoram Hermitage of Seonunsa Temple. A deep cut is made around the head, and the engraving gets thicker from the head to the bottom of the statue. The rectangular, flat face looks somewhat stiff, but the upturned thin eyes, high nose, and straight, plump lips form a mystical smile on the face. 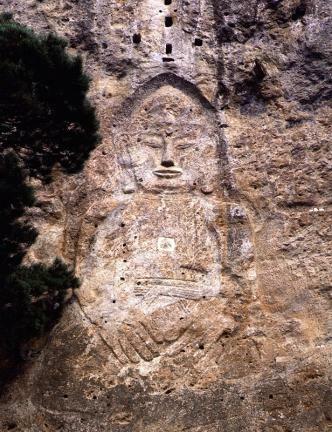 There are thin samdo, i.e., three wrinkles, on the neck, but the top of the body and the head are almost stuck together; thus, the head seems to have been placed on the top of the body. The upper body is rectangular, and the chest is wide and flat. 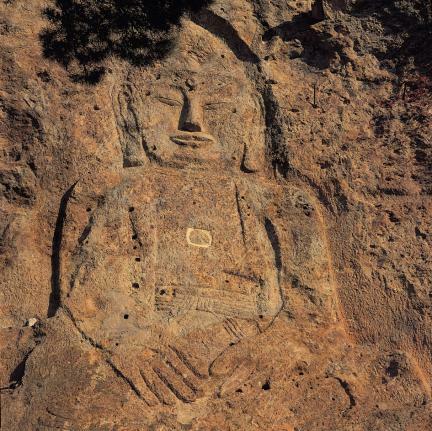 As such, the statue is expressed in a planar way. The robe covers both shoulders, and the pleats are superficially expressed in lines. The knot of the skirt is clearly carved across the bottom of the flat chest. The two hands placed side by side on the knees look relatively big and coarse compared to the size of the body, so the overall shape of the statue appears unrealistic. 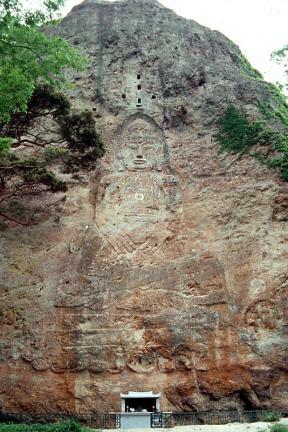 This statue is made in the unique style of rock-carved Buddha of the Goryeo Dynasty, similar to the Rock-Carved Seated Buddha in Wolchulsan Mountain. The tiered top pedestal built comparatively high is covered with the lower ends of the robe, and the bottom pedestal is depicted with a pattern of lotus flowers facing downward. 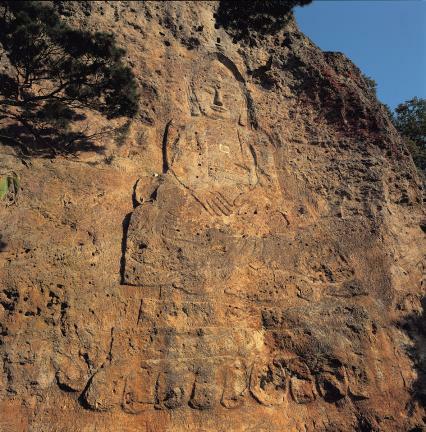 This statue of Buddha is drawing a lot of attention as one of the big rock-carved Buddhist statues of the early Goryeo Dynasty, particularly because the secret record on the Donghak Peasant Revolution was discovered from the chest area of the statue.